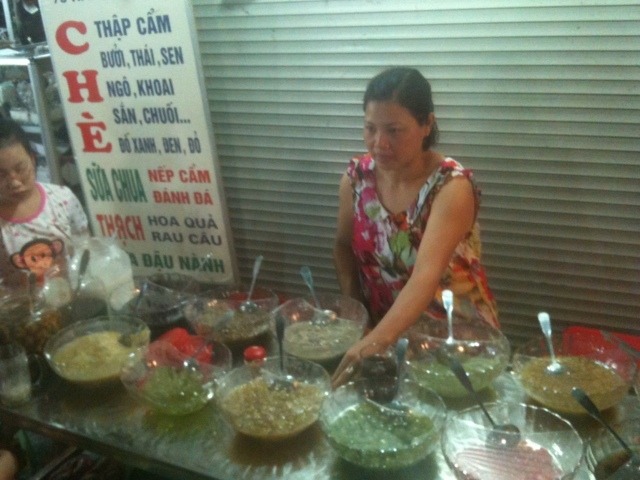 So this is our second day in Hanoi. 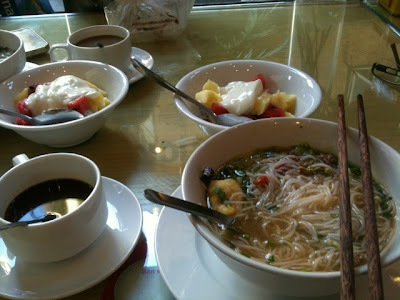 We ordered the breakfast set from the motel we were staying for USD3. Breakfast set consisted of a noodle dish, a dessert and a hot drink. 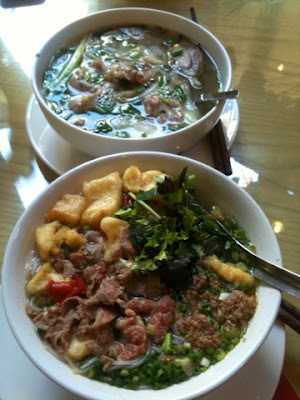 The dishes we ordered above is a beef pho, and vermicelli sour crab soup with soya curd. 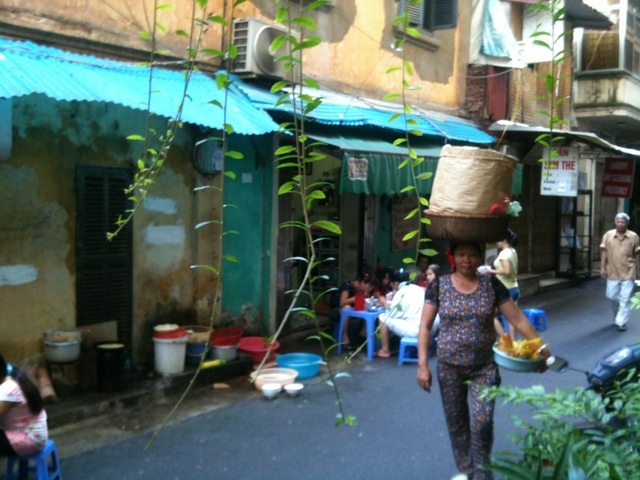 Did you see the lady balancing a heavy package on her head? Anyways, around these parts, try not to be caught taking pictures of people as they would expect you to purchase something of them in return.. So we joined a day tour for USD18. It wasn't too bad but rather tiring. Turns out it was just me and my travel buddy. 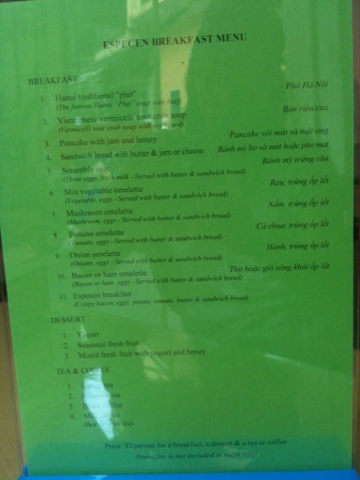 We were taken to visit the temple, the Ho Chi Minh mausoleum, the Ho Chi Minh park, and the University Of Literature. The University of Literature is one of the oldest and first university in Vietnam set up in the year 1010! I can't remember the name of the temple though. The HCM mausoleum is actually a glass burial site where the body of the founder HCM is kept. People entering the site are forbidden from bringing in electronics, cameras, and bottles of water. As a sign of respect, short skirts and short sleeved visitors are asked to cover themselves with a scarf. 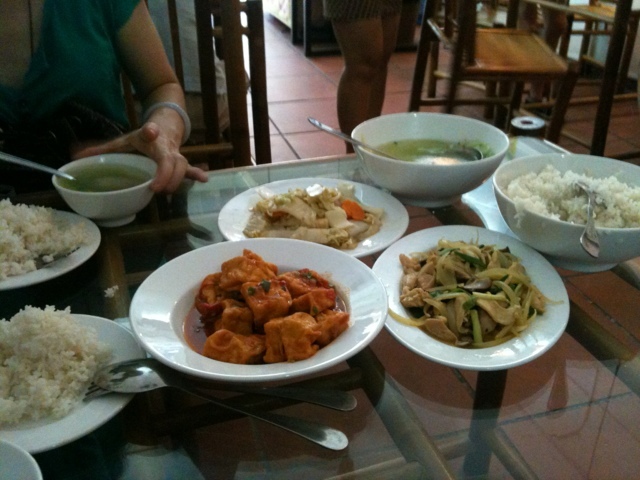 The picture above is of our three course lunch at a cafe not too far from our hostel. The last picture is taken at our foot massage near our hostel about less than 4 mins away. It was a 70 min foot massage that cost USD7. For tips, we were requested to give about USD2. We didn't actually get to have any dinner tonight. Instead we ended up having little snacks throughout the evening. Above is Che, costing about 20,000VDN. It's basically eaten like ais kacang, but you can pick your own toppings into the crushed ice which is filled into a bowl or glass cup.